"By early 1921, Trotsky and the Red Army had triumphed in the civil war [over the White Army and other factions]. But victory had come at a heavy price. To avoid alienating the rural population, the Reds had abandoned any talk of collective farming, or the socialization of the land. The villagers were allowed to keep whatever land they had seized in 1917. This kept the peasants out of the clutches of counter-revolution. But it created a profound dilemma. Under the system of so-called 'war communism', the workers were paid almost entirely in ration entitlements. Already by 1918 the Russian currency had become virtually worthless. With the peasants in control of the land, as food supplies in the cities dwindled, the regime had no option but to resort to requisitioning, if necessary by force. The result was a terrifying downward spiral, in which peasant cultivation collapsed and the urban population, threatened with starvation, fled back to the countryside. The Soviet regime had won the civil war, but as a movement of proletarian revolution it had forfeited its raison d'etre. Its international campaign of revolution had failed. And what was left of Russia was a far cry from what Marxism had promised. By the end of 1920 the population of Petrograd had plunged by 75 percent and that of Moscow by almost half. "For Lenin himself there was one pre-eminent benchmark for the success of his regime: the Paris Commune of 1871, the originator of modern Communism. 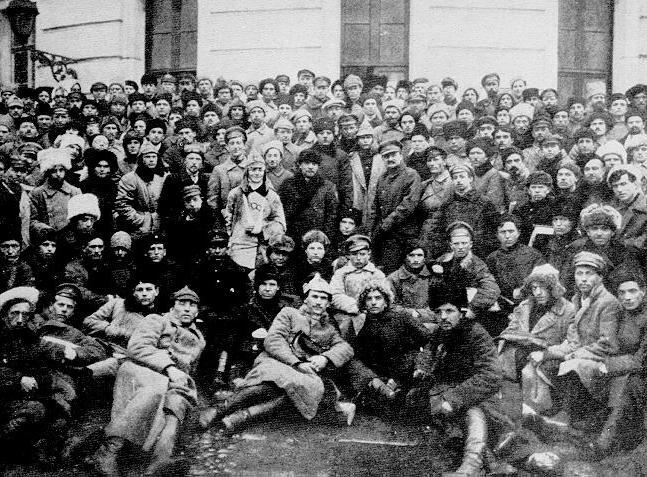 In early March 1921, as the Bolshevik regime prepared to celebrate the fiftieth anniversary of that revolutionary landmark at the 10th Party Congress, it was shaken by an event unprecedented in its own history. On 1 March the soldiers and sailors of the Kronstadt naval base outside Petrograd, one of the legendary sites of the 1917 revolution, rose up in rebellion against the Soviet regime. They issued a manifesto calling for free and fair elections to the Soviets, freedom of speech, the right of assembly for non-party members, the formation of free labour unions, the release of all socialist political prisoners and the independent investigation of the charges against all those incarcerated by the regime, the separation of party and state, the equalization of rations, and the granting of full freedom for production for small independent producers. Against this libertarian challenge the Bolsheviks responded as they had done consistently since November 1917, with massive force. With Tukhachevsky taking command, 50,000 Red Guards were hurled against Kronstadt. Perhaps as many as two thousand rebels were executed. Thousands more were jailed. By the time the 10th Party Congress had concluded, the tidy-up had begun. "On politics there could be no compromise. But on economic policy Lenin was willing to be flexible. The strategy of forced contributions had led to a disaster. Inflation was rampant. In the factories there was a veritable epidemic of absenteeism. On 21 March the sensation of the Communist Party conference was Lenin's proclamation of the so-called New Economic Policy. In towns and cities the strategy of total collectivization was reversed. Private property was permitted for businesses employing fewer than 20 workers. The coercive requisitioning of food was replaced by a regular tax that from 1924 was levied in cash. To restore confidence, a new gold-backed currency would be introduced. "By 1921, having abandoned its revolutionary invasion of Poland and its global campaign against the British Empire, and having retreated publicly, both at home and abroad, toward a compromise with capitalism, the Soviet regime appeared to the Western Powers less like a revolutionary threat than a failed state. As harvest season approached and a drought struck the weakened farmers of the Volga region, it became apparent that the New Economic Policy had come too late. The civil war had already cost well over a million dead. Now, in what had once been the bread basket of Europe, tens of millions were at risk of starvation. On 13 July, Lenin licensed the non-conformist writer Maxim Gorky to issue an international appeal for charity, not on behalf of worldwide revolution, but in the language of humanism, on behalf of 'the country of Tolstoy, Dostoyevsky, Mendeleyev ... Mussorgsky' and 'Glinka'. 'All honest people' across the world were to rally to his country's aid. This was no longer revolutionary internationalism. Without 'bread and medicine' Russia itself would die."